Up to this point we've had a mild -- an unbelievably mild -- winter. Couple inches of snow, max. Most of the time we've had bare ground. Looks like that's all about to change. 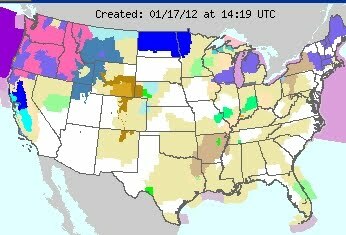 See those giant pink-and-blue splotches all over the Pacific northwest? That's us. Right now it's howling wind outside, but with only a light dusting of snow. But more is forecast. As in, a lot more. Granted weather reports have been wrong before, but of course we can't take chances. 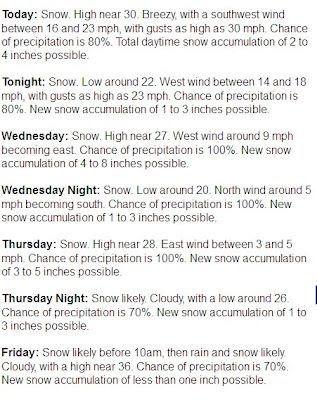 The forecasts are calling for as much as two feet of snow. Couple that with wind, and we'll have drifts that could be chest high or higher. And since we're two miles off-road, meaning the county doesn't plow, our road WILL be drifted shut. That's just a fact of life around here, and we expect this to happen two or three times every winter. We were supposed to have our steer Nebuchadnezzar butchered tomorrow, but I think we can comfortably assume the mobile butchers won't be able to get anywhere near our place. So Nebuchadnezzar gets a temporary reprieve. Normally Tuesday (today) is our "city day." The girls both have lessons (music and gymnastics) in the city, and it's a chance for me to do errands, etc. But it also means we don't get back until after dark, and the Palouse Highway is famous for being virtually obliterated during snowy and windy conditions. I have no desire to become a statistic, especially with the kids in the car, so we're staying firmly PUT this week! Wow! Be safe if it hits! Love it - wish I were there. I'd love to help feed the critters. Where I am (VA), we've only had a dusting of snow and warm temps. Curl up with Lydia and a good book. Can't wait to see the pics. We have had very little snow here in Colorado this year. If we do not get more there will be water shortages this summer. Not that I want a repeat of the winter of 2005-2006 when we got 24" of snow one weekend, and then every weekend for the next six we got 18" to 24" each weekend. That was too much! PICS OF A BLIZZARD!!!! That will be so cool to see. Stay warm and safe. Hope we get some rain with this storm. Wind has been howling all day up here and I am already tired of sweeping off the covered porches! It is all the way to the doors. We have received probably 6-8 inches so far, but since it is very light and fluffy, and the wind is howling, it is really difficult to tell. Guess the animals will be in the barn for dinner tonight. They kinda complained when I fed them outside this morning. At least we do not get the drifts up here north of CDA like they do on the Palouse. Stay safe and warm. BTW...I do love the snow, just not the howling wind blowing it around. I'm NE of Sandpoint and got 15 inches since 3 am. Light flurry's now until 8pm, then it begins. 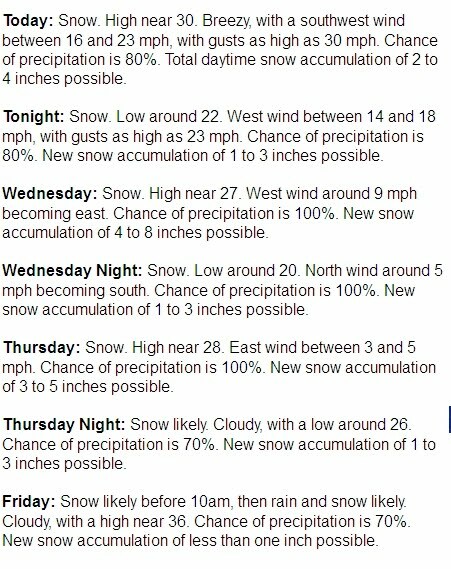 Like you, 10 day forecast calls for all snow. Ok, I have a few questions. Living in Florida.... our animals very rarely have to be inside a barn. Do they create a horrible mess in the barn. How long does it take to clean up after them? Do you have a snow plow attachment for your vehicle? Do you have to park your vehicle inside one of your structures? Does the power go out when you get that kind of snow? Well, they POOP in the barn, but you sorta get used to that. Usually I only clean the barn every few months, but that's because the animals aren't in it full-time. The exception is Matilda's stall (Matilda is our senior Jersey cow, and sorta a pet) -- I tuck her into her stall every night, and since she has very loose stools, I clean her stall every day. The animals prefer to be outside except in bad weather so most of the time cleaning the barn isn't necessary. We don't have a snow attachment for our vehicle (they're expensive!) but recently a neighbor bought one, and did a fairly decent job of keeping the roads open during yesterday's near-blizzard conditions. We don't park our vehicles inside a structure because we don't have a structure dedicated to that (our outbuildings are for animals). Although the power flickered yesterday, we didn't have a power outage and frankly I'm surprised because the wind was SCREAMING. In the evening I lit two oil lamps just in case, but the lights stayed on. We're fully prepared in case the power goes out, of course, but it was nice to have the lights. I'll update with photos some time today. My Dear Patrice, Isn't it fortunate that you had the foresight to lay in a few extra groceries so you don't have to rush out in this mess? ;-) During our Halloween '11 blizzard here in MA a few of my acquaintances found themselves without simple necessities such as bread and milk and cereal for the kids. Even trekking from store to store in the blizzard yielded no provisions for them. One of the more thoughtful acquaintances actually confessed this to me one evening at work and said all he could think about was what I had told him ages ago - get a few supplies in. How hard is that? Anyway, this same fellow asked me how to start prepping, nothing major, just a few things for the kids. This one small step will help him and his family in the future.... I hope. Most people seem to forget necessities when the weather is nice and all things are quiet. Patrice, you have inspired me to prepare in many different ways, not just food for me. Keep up the good work!